I’ve just got back from the 3 days Rip Curl Pro Terengganu 6-Star Surfing Event at Batu Burok Beach it was an awesome event. Special thanks to Rip Curl Malaysia for sponsoring a few of us bloggers to be apart of this spectacular surfing event in Malaysia. If you’ve been following me on my Instagram or Facebook, I’ve shared live updates of the event. I’m sure most of you would like to know who won the competition, the results will be in this post. The 3 days event was open to public and the weather was pretty good with good waves for the surfers. Rip Curl Pro Terengganu 2012 is the first ever 6-star Asian Surfing Championship surfing competition in Malaysia. The event will become part of the ASC platform for Malaysian surfers to compete with other Asian Surfers in events around the region. Surfers from all over South-East Asia are competing in the event which will have 5 division of competition (Men’s Open, Women’s Open, Master’s Open, Body-board Open & Longboard Open) offering a total prize of RM 36,700 cash, trophies and prizes from Rip Curl. In our goodies bags, Rip Curl Pro Terengganu limited edition t-shirt, cap and Sunplay sun lotion with a Rip Curl mini coin purse. 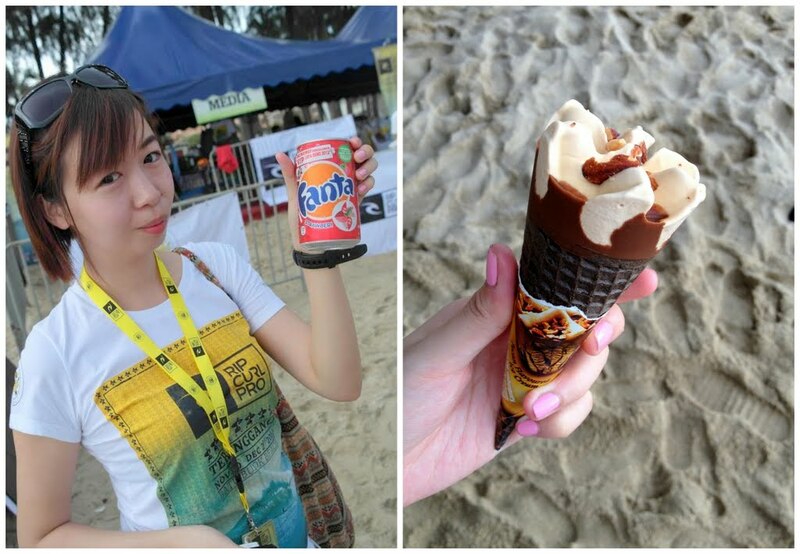 I’m thrilled to be at the most anticipated surf event in Malaysia! The weather was very windy on the first day itself. Before the competition begins, we took a group photo. Together with bloggers Bok, Jess, Rebecca, Wendy, Samuel, Daniel and a few other media representative. The crowds at the event on the first day when the first and second heat surf competition begins. 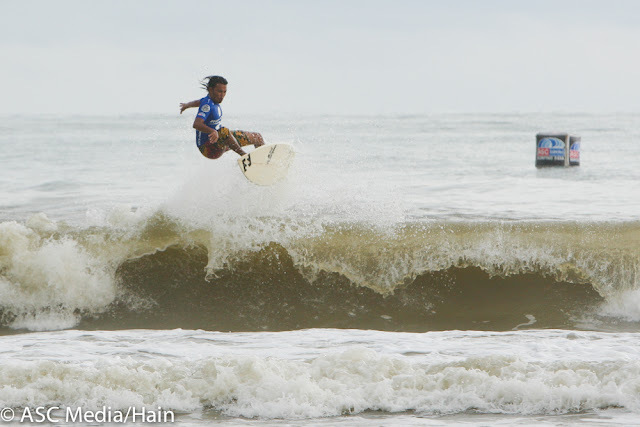 Malaysia’s own surfer girl Brenda Lee, shares with us on her life and surfing. She started surfing 5 years ago. Surfing requires determination and passion. When you fall or hit by waves, you got to get up and don’t give up. Surfing is certainly not a man’s sport. Brenda also shares with us some basic tips if you want to be a surfer. Firstly, one must know how to swim (as you will be out in the waters) before learning how to surf by enrolling in a surfing lesson, then get a surf board and keep practicing. A surfboard would cost around RM 1.5K to RM 2K, each individual should have their own surf board as your surfboard is custom made which suits and fit your own body weight to maintain buoyancy. There are games stations for the public and car stickers to be won. Fanta sponsoring free flow of drinks. Having Fanta to quench thirst and Nestle ice cream to stay cool at the beach. Watching the competition, I didn’t manage to snap good photos and it wasn’t very clear due to the distance so there’s only a few pictures. Video of Rip Curl Pro Day 1 Highlights by ISC Tour. Besides the surfing competitions, here’s Laura from Germany. She draws pretty stuff on surf boards! It all started when she drew on her husband surf board and then her own. 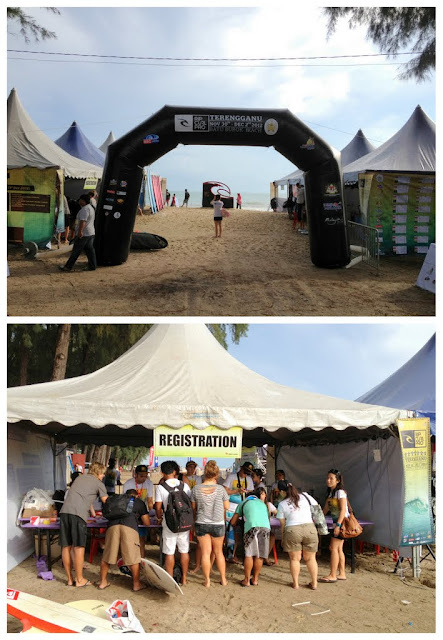 Surfers at Rip Cur Pro Terengganu had the privilege to get their surf boards draw by Laura. She’s really talented. Do check her work out on Laura Pabst De Cesar Illustration. Rip Curl merchandise were sold at the event with special discounts of 30% for flip-flops and T-shirt for RM 50 only but are very limited. I got a T-Shirt and two flip flops for myself and for the boyfriend. At the event besides surfing, there’s Skateboarding by Carver. Skateboarders are trying to beat a time record here. A simple demo on surf boards in the making here. There’s a special workshop showcasing how surf boards are made to the public as well. It’s informative to some of us where we are not well verse with surfing. The most exciting workshop is the Surf Clinic by Rip Curl School of Surf. Jonni from Bali teaches some basics and beginner lessons on surfing. The surf clinic is a 1 hour class, it started off with introduction of surfing and some basic things to know about the surfboard and our body positions when we’re on it. We had a few tries on jumping up. Maintaining balance and knowing how to control the speed. After a couple of tries on the sand, we’re heading out to the beach. Jonni coaches us how to catch a wave and taking the jump. I’m obviously trying to jump here but thinking too much to balance and ended up…. another wave came and I’m about to fall. As you see I’m still struggling here instead of jumping up on the board. If you want to learn how to surf, you gotta be determine and keep trying no matter how many times you fall and got hit by the waves or drinking lots of salt water. At the end of the session, I’m quite exhausted but it was fun and now I’ve tried surfing! I do enjoy it – quite a lot in fact. If I have the chance I will certainly try surfing, keep trying till I can stand properly. Another group photo with Rebecca, Samuel, Bok and Jess. If you wanna learn how to surf, you can do so in Rip Curl School of Surf in Bali, Indonesia. They offer a few surfing courses here in 3 different locations. Good Wood NYC from ApanamaMy had a booth at the event. They sell some pretty accessories and iPhone covers. On the first night we had BBQ party at the Surfer’s crib for some bonding session and watching Rip Curl Pro Padang 2011 video the waves are awesome there! Group photo with Ariff, Amos, Jonni and Samuel on the second day, the weather was hot and sunny. 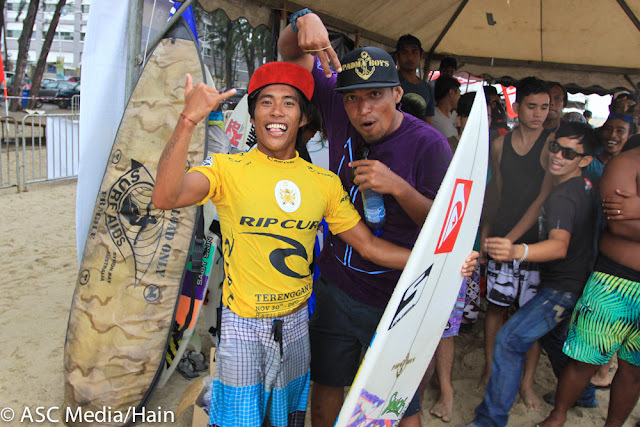 Catch Rip Curl Pro Terengganu Day 2 video highlights by ISC Tour. On the second night, we were all invited to the Gala Dinner in conjunction with Rip Curl Pro Terengganu hosted by Tourism Terengganu and Tourism Malaysia at Ri-Yaz Heritage Marina Resort & Spa. Cultural dance performance.On the final day, the excitement fills the air although during the afternoon it was raining with challenging weather conditions but it didn’t stop most of us from watching the semi-finals and finals. Made Darmayasa from Bali wins his first ever ASC Men’s Open competition at the Rip Curl Pro Terengganu. 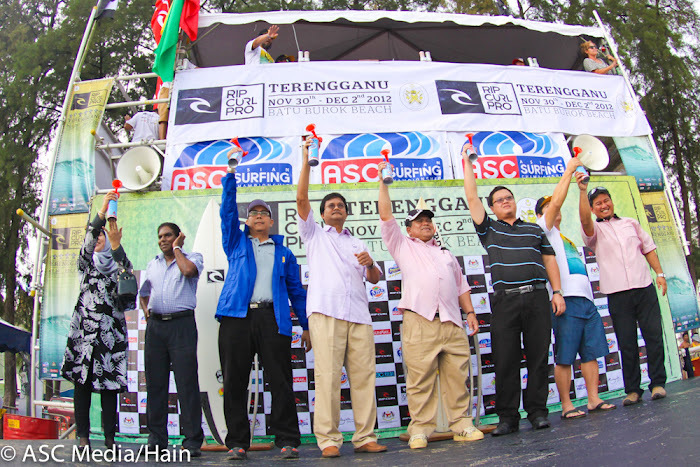 Watch the Rip Curl Pro Terengganu surfing event videos here. Stay tune to Rip Curl’s latest news on asia.ripcurl.com or Facebook at Rip Curl Malaysia and Rip Curl Asia.